What are the effects of black mold on your health? We are exposed to a number of hidden pollutants in our own homes and levels can be far higher than we realise. Some people are more susceptible to the effects than others. Here we look at the sources and the effects of indoor pollution. Mould (or mold) releases spores into the air. Although spores are present in the air all the time and are part of the natural environment their number increases hugely when the conditions allow. If your home has visible mould on walls then this should be a cause for concern. The World Health Organisation (WHO) are concerned about the threat to health for occupants of damp or mouldy buildings as they are at increased risk of experiencing health problems such as respiratory infections, allergic rhinitis and asthma. "Some people are more sensitive to mould than others, and some groups are especially vulnerable. Additional effort should be made to keep away from damp and mould babies and children, elderly people, those with existing skin problems, such as eczema, or respiratory problems, such as allergies and asthma, and anyone who is immuno-compromised (e.g., chemotherapy patients). On the other hand, WHO has demonstrated that remedial action works. For example, research shows that people living in well-insulated and adequately ventilated accommodation are less likely to visit their doctor or be admitted to hospital due to respiratory conditions than those living in damp homes." "It is likely that long-term exposure to air pollution is linked to the development of asthma. For people who already have asthma, there’s strong evidence that air pollution can make it worse"
The NHS has also produced information on damp and mould and its effect on health. Although it may be tempting to try to prevent mold (mould) with anti-mold paints, in practise the mold almost always wins!. The other problem with this approach is that if you have visible mold forming in your home then it will also be forming in areas that you cannot see, or cannot get to. For example down the back of wardrobes. The only effective long-term solution is to have a controlled, but constant amount of ventilation in your home. 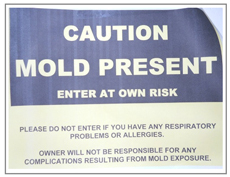 This will reduce humidity, stop new mold forming and kill the existing mold. Dust mites live and multiply in warm humid places. Dust mite particles are found in pillows, mattresses, carpet and upholstered furniture and will float into the air when bedding or furniture is disturbed. Dust mites aggravate symptoms for asthma sufferers and those with Chronic obstructive pulmonary disease (COPD). 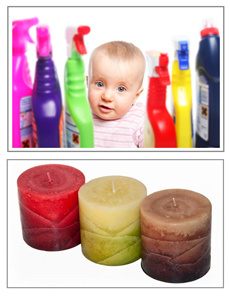 These chemicals are used in air fresheners and cleaning products. Limonene (lemon smell) and alpha-pinene (pine smell) are two chemicals used to add fragrance to every day household products. Limonene is known react with the air to produce formaldehyde. The BBC series 'Trust me I'm a Doctor' researched the issue of indoor pollutants from perfumed products and concluded that levels of indoor pollution rose significantly over the winter months and were probably far higher than in the past because of modern air-tight houses. Cooking with gas gives off nitrogen dioxide and particles, and smoke generated by fires or stoves add to the cocktail of pollutants in your home.